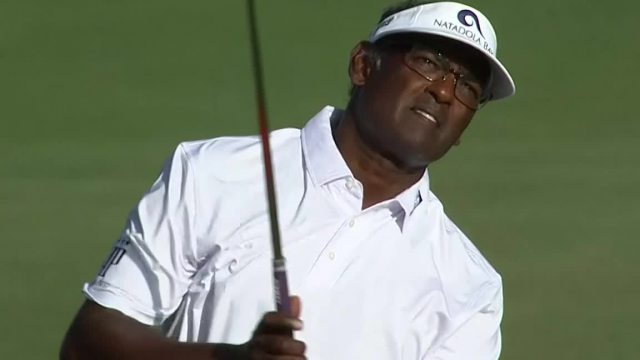 In the final round of The Honda Classic 2019, Vijay Singh navigates his 191-yard approach to inside 9 feet of the cup at the par-4 14th hole. Following a second-round 68, Vijay Singh reflects on his play in the 2017 RBC Canadian Open with Dennis Paulson from PGA TOUR Radio. In the second round of THE PLAYERS Championship 2017, Vijay Singh rolls in a 28-foot birdie putt from off the front of the green on the par-4 12th hole. In the second round of THE PLAYERS Championship 2017, Vijay Singh sinks a 24-foot birdie putt on the challenging par-4 5th hole.